I never knew my grandparents. My parents came from Germany. They had three children when they came to this country: the two older girls, Lena and Mary, and John, the older boy. They came to this country sometime about 1885, I would say. They first settled on a farm near Leonardville, Kansas. That’s where I was born. They lived there for quite a number of years, possibly eight or ten years, and moved from there to what they call Fancy Creek. It was a farm five miles northwest of Green, Kansas. And my earliest recollections go back to that place. We farmed there, of course, and I started school there. The house is no longer there. This was an 80-acre farm, and I don’t think anybody ever lived there after we left there. It was dilapidated and the bigger farmers, of course, came in and took over.We moved to Fancy Creek and lived there for five years and then moved down to within a mile of Green, Kansas, to what is known as the Habluetzel place. We lived there for nine years and while we were on the Habluetzel place, Dad bought a home for ourselves which was just a mile north and one-half mile east of Green. I lived on that place for five years and then started to work for farmers around there. I worked for farmers in that area for five years and started school, my preparation for the ministry. I never did meet my grandparents and do not know much about them. I do know that in my father’s family there were 12 children and in my mother’s family there were, I don’t know how many children, but there were three sets of twins. That’s why Lydia always thought we ought to have twins. The only relatives that we know of that came to this country from my father’s side of the family were some cousins who lived in Manden, North Dakota. In Germany, the location of my family was Weurtenberg. It’s in southern Germany. And of the different dialects that they spoke in Germany, this part was known as Schwabenland. My father, besides being a farmer, was what was known as a local preacher. He did preach before he came to this country. Fact of the case is, he went to the community where mother’s people lived and conducted a religious service there, and that’s where my mother and dad got acquainted. My father’s full name was Johann Friederich; I don’t think he had a middle name. The pronunciation was Americanized, see. Mother’s maiden name was Weinman. She had three brothers, I believe, and I don’t know how many sisters; one came to this country. She was Barbara Trumpp and lived near Riley. I was about eight years old when we moved from Fancy Creek down to the Habluetzel place. We were on a farm there, of course, and we had horses and we had cows and we had pigs and we had chickens and we had dogs and we had cats and we had mules, and we just sort of kept busy doing things on the farm. As we grew older and able to milk the cow, we milked the cow and when were old enough to run a cultivator, we cultivated. Of course, that was the day when all of the farm work was done with horses and mules, and that’s the way we lived.Work was expected of the children. We were expected to feed the horses and the cattle and the pigs and the chickens. People were much more independent then than what they are now. We had our own eggs and raised our own feed for the horses and cattle and the pigs and so forth. We would even take corn to the mill to have corn meal ground; we’d take wheat to the mill to have flour ground and take it home and use it through the winter. I lived nine years on the Habluetzel place and that was more like home to me than any other one place. Fact of the matter is we have lived in this our retirement home here in Lincoln more than twice as long as I lived in any other one place. Ebenezer Church was built 100 years ago. They observed their 100th anniversary in 1976. This was the home church for us. My father, when he came to this country, started in as a local preacher there and of course he was a farmer. The preacher had two or three different churches. That was the horse and buggy day when you couldn’t get to more than one place of a morning or afternoon or evening. Dad would take his turn at preaching when the regular preacher was in one of the other churches. Dad never took anything for preaching. He’s got it all over me on that; I made my living preaching. He says the only thing that he ever got in a material way for preaching was one time in the early day when the preacher came out and asked whether he would go to this church on Sunday and preach there. He said, yes, he’d be glad to go and preach there, but he doesn’t have any shoes to wear other than the plow shoes that he was wearing, as he was plowing. Then the preacher sent a new pair of boots for him to wear. He says that’s the only remuneration he ever got. This would have been about 1893 or 1894; I was born in 1891. A local preacher was the same as what we call a lay speaker or lay preacher today. He had not been to seminary; he hadn’t had any preparation. My dad had a remarkable mind to remember things. He had sermon books. He would read a sermon and then preach that sermon on Sunday without any notes. The only notes that my dad used to take to the pulpit was the margin of a newspaper on which he would have the references, texts, the hymns that he wanted to use and that was about it; that was the extent of his notes. He preached in Deutsch, in German. He never talked English. My dad tried to, but his English was very poor. I remember going to Bala with him one time. That’s the little town near where Aunt Barbara Trumpp lived. That was my mother’s sister. I remember going with him down there on one occasion because that’s where my cousins were. The only elementary school that I attended was Pleasant View School, District No. 65, there within half a mile of the Habluetzel place where we lived for nine years. Well, I did go a little in Fancy Creek, but not regularly. I went the nine years at the Pleasant View school and then we left there in 1908, and I did not get back to school then until 1917, when I went to Central Wesleyan Academy in Warrenton, Missouri. We were required to go to school. The last years of my school days, children were required to go to school. Youngsters were not permitted to miss more than so many days. I remember very definitely, dad wanted me to stay home and help shuck corn, but he would have had to pay a $15 fine, I believe, if I stayed home more than so many days, so he kept me out I believe it was two weeks, and I shucked corn for the two weeks and had to go back to school.We went to school on the wagon or horseback in bad weather; otherwise we would walk. The farmers would sometimes change off. The one farmer would take the kids in the morning when the snow was deep in the wagon and then the other farmer would probably, living in the same area, bring them back. That’s the only way we knew to go. These were one-room schools with a coal stove or a wood stove and the teacher would send one of the boys out to get a bucket of coal when they ran out of coal. I never will forget one teacher. I was about 12 years old then I guess, or 14. They were having revival meetings in the little town of Green. In that day, a revival meeting meant an altar service. I went forward on an evening to accept Christ, and my teacher, a lady teacher, was in church that night, too. And the next day at school, she told me to stay a little while after the other kids left. I didn’t know what in the world I had done, but I stayed. She told me then, she says: “I just want to tell you that I was so happy that you went forward last night.” I never will forget that. That teacher was Emma Van Holf. It was the custom in my home for us boys to stay at home or work for dad or work for farmers and give dad the money that we earned until we were 21. After we were 21, we were on our own. I stayed at home and worked with dad until I was 21, and then I worked one year for Charlie Mabie on the farm. I worked two years for Charlie Klein. I worked another two summers for my brother John on the same Klein place and then I, in September of 1917, started my preparation for the ministry, starting first in the academy, which was the equivalent of the first year of high school. I was 26 years old. This was at Warrenton, Missouri, 60 miles west of St. Louis.That was German Methodism’s school. It was a school primarily established for the purpose of training German Methodist preachers. The academy was the equivalent of high school, because I had never had any other high school. I was at Warrenton for the first academy year in the fall of 1917 and the spring of ’18. I was drafted into the service in the summer of 1918 and went to France in September of 1918; returned from France in July of 1919; came back to the home community of Green and worked on the farm that summer. I had said to myself after having been in France: “I never will leave Clay County, Kansas, again,” but when time came for school to start, I just couldn’t resist the temptation to go back to Warrenton and start my second academy year. I served in a branch of the cavalry. It was known as a remount squadron. We were not really in the cavalry; we were not a combatant organization. We were taking care of the horses and mules that the artillery and cavalry used. When a shipment of horses and mules came to France, we would take them over and take care of them until they were issued to the artillery or the cavalry or wherever they would go. I went to France in a ship which had been taken over from the Russians, known as the ship Kursk. We were two weeks crossing the Atlantic Ocean, and landed at Brest, France. We were in camp about 40 or 50 miles out of Paris for a while, working out from there. The Armistice was signed in November of 1918, and then we took care of the government’s horses and mules over there, that is my squadron did, until we could make up public auctions and sell them to the French people. They needed our horses and mules; we didn’t want to bring them back, so we sold them to the French people at public auction, and that took me pretty much throughout France. Finally, we had our last sales in the extreme southern part of France and when we got through then in June of 1919, we sailed out of Marseilles, out through the Mediterranean, past the Rock of Gibraltar and back. There wasn’t nearly as much excitement [over signing of the Armistice on Nov. 11, 1919] over there than there was over here in this country. Over here, the country went wild because the war was over. We had heard rumors of an armistice being signed before, but we just thought it was another false report. But, of course, we were delighted when we found out the war was over. And then the next anxious thing for us was, when will we get to go home? But, because being in a remount squadron, we had to get rid of these animals, so they kept us over there from November of 1918 until June of 1919, until we got rid of the government’s horses and mules. From the time that I described a while ago, when I decided that I wanted to lead the Christian life, there was a conviction came over me that I ought to go into the Christian ministry. It was possibly partially due to my dad’s being a lay preacher, a local preacher. That just grew on me. I had the best possible chance to get started farming on this Klein place, where I worked for four years. When Charlie Klein and his family decided to retire and move to Clay Center, they offered to let me take over their farm with their equipment and get started there, and that is and was one of the best-producing farms in Clay County. I would have had a wonderful chance there and it was a bit of a temptation, but then I just felt like I couldn’t settle down on the farm. My brother John was renting. I went over one night after Charlie Klein offered to rent me his place and I told him [John] I didn’t know whether I wanted to do that. I went over to John. I told him, “You rent Charlie Klein’s place; it’s the best place you can get and it’s a good producing place.” He said, “Will you stay with me and help me operate it?” It was a half section of land and took two men. I said, “Yes, that’s part of the understanding that I’ll stay there for a while.” He rented the place and Charlie Klein had an auction. I stayed with him until he sold off all his stuff and helped him build his house in Clay Center. He moved in there and John got married that spring then and I worked with him two years.After I got into the college, I was president of the college Young Men’s Christian Association one year, about 1922 or ’23. I was a sophomore; I skipped my junior year. I was about 30 or 31. I was very much interested in gospel team work. I never could sing, of course, but I could mumble a little, talk. I went into St. Louis and bought a used Ford car; that was about 1922, I guess. I guess it was a Model T; the Model A followed that. I bought a Ford touring car there for $225 so that I could take the four men that were on my team to the different churches around. We conducted a lot of gospel team services. Now, that would have been in the years 1921-’22. I started preaching in 1923. I took a student appointment the last year I was at Warrenton, at Cuba, Missouri, and got married the next spring. We [Fred and Lydia] were born in the same community. She was born two and one-half years later than I. She claims that I kissed her when she was a baby. Now, this is all imagination, but she says all mothers visited other mothers when they had new babies, and she is sure that when she was born, my mother took me as a two and one-half year old down to see her mother and that I kissed her when she was a baby. Now, I do not remember that, but that’s what she claims. Anyway, that’s rather interesting, our love affair. I have been in love with mother all my life, that is all that I can remember. 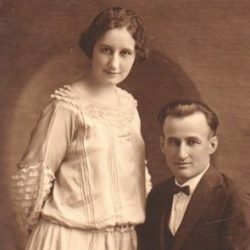 I never cared for other girls.We were married on June 13, 1924, Friday the 13th, in mother’s parents’ home, by a preacher friend of mother’s nurse friend, by the name of John Neumeyer. We almost missed our own wedding because we had been out picking daisies before and just got in and got ready to get married. It was just a home wedding. We got married there and then I took Lydia down to Cuba, Missouri, where we served the church there during that summer. We had a chivaree after the wedding, which was in the afternoon. In the evening, we went out to Marie Hahn’s house and the gang from the Ebenezer congregation, the young people, came there and gave us a chivaree. Outside around the house, they shot guns and rang cowbells and rattled tin cans and sang and yelled, just made all the horrible noise that they could. It is just sort of an initiation into married life. I served Cuba, Missouri, during my senior year and, of course, I was graduated in June of 1924, married the 13th — I was 33 the next September, I was 32 then — and we served Cuba until September. It was always my ambition to come into the West German conference, and we were assigned to the church at Macon, Nebraska. When I got the word that we were to go to Macon, Nebraska, I went to the depot, to the station there in Cuba, went to the station agent and said: “Where is Macon, Nebraska?” He thought a moment and got his book out and he looked and he couldn’t find it and he said: “It’s not in the United States.” But, the fact of the case is, Macon is not a railroad town; it’s an inland town and naturally it didn’t show on his railroad map. We moved to Macon and were there for six years then. Macon was a rural community and our people were practically all farmers. We had a wonderful time there. Our salary for the first year was $1,200, plus — yes, the farmers when they would butcher would bring meat. They would let us go out into their hog pen and pick up corn cobs for fuel. The farmers that had a creek run through their farm would let me go down and cut wood out of their creek for fuel. I did quite a little of that. But we had a wonderful time there and, of course, Rosina and Doris were born there. Our next assignment was to Western, Nebraska, where we were for five years. Those were the hard years from 1930 to 1935. We didn’t get our salary in full any one year the five years that we were there. And yet we were as happy as we could be because we felt that the farmers were doing all that they could for us. We were cutting wood and keeping warm and trying to keep the church work going. From Western, we moved to Gering. That was a 400 mile move and we had an interesting time there. It was an entirely different situation in that they had irrigation out there and the farmers grew sugar beets and had a sugar beet factory in Gering and in Scottsbluff. I had a lot of weddings there. The truckers would come through and get their license at the courthouse and come on down to the parsonage to get married. We had a very interesting and very good time at Gering.We left Gering in September of 1940 and moved to McCook, where we had a lot of problems to overcome. Our predecessor had been a bit unethical in his business matters and in other ways, and we went there at a $200 cut in salary, simply because the bishop wanted us to go there. Before I consented to go there I got his word that if we did blow up there the first year, he would remember us and give us a decent appointment the next year. Well, we stayed at McCook only three years and it was there that we had a junior college in town and Rosina started, I think she had, one year in junior college there. All the children were in school and it was while we were at McCook that we got into the Second World War. On Dec. 7, 1941, we had been calling. When we got home, the girls had heard over the radio that Pearl Harbor had been bombed and that we were getting into the Second World War. Rosina worked at the air base awhile and I did a little work as chaplain out at the air base, in connection with my church work there at McCook. And, strange as it may seem, even though we went to McCook under trying situations, I felt very definitely that we should go there. I felt that God wanted us to go there, even though we were going at a cut in salary. I told the bishop: “I’ve got children ready for college. I need to think about them.” And I said: “If we blow up here, what will become of us?” And he promised us that he would take care of us if we did have to move there, if we couldn’t make a go of it. Strange as it may seem, it was while we were at McCook when economically things were at the bottom, I was able to raise a little money and buy some land. You could buy land for $10 an acre at that time, land that the federal government had taken over from the farmers who couldn’t make their payments. That’s where we got on our feet financially, by buying cheap land and holding onto it and then selling it later on. So it doesn’t always pay to think only of the dollar. We moved from McCook to York the fall of 1943. The York church was a fine church, fine congregation. We had a wonderful time the seven years that we were there. We had a very good time there; the people were good to us and we had an interesting time there, and of course Rosina and Doris were both married while we were at York. Rosina had gone to Nebraska Wesleyan. Doris had gone into training at Scottsbluff Methodist Hospital, nurses’ training. From York we moved to our last regular appointment, which was Seward. We moved there in June of 1950. The conferences then met in June rather than September, so in reality, we were at York really only six years and nine months. I think my first conference appointment probably was on the conference board of education. I served on that for a number of years and then became a member of the board of trustees of Nebraska Wesleyan University and during the time that we were at York, the authorities from Wesleyan came out to York one time and asked me to go into the financial work for Nebraska Wesleyan. But I hesitated to do that. I didn’t like to leave the ministry. I had a boy whom I thought a lot of, who was just at the age at that time that I thought ought not be left without a dad at home, and I would have been on the road there. And I’ve always been glad that I didn’t get into that work. But I did serve on the Wesleyan board of trustees. At the conference time of 1949, that was the last year that we were at York, I was made president of the conference board of trustees, and served at that in connection with our serving our own local church for five years, until 1954. The conference board of trustees serves a function very similar to the function that the board of trustees of a local church serves. The conference has a lot of property that was given to the conference or to the church through the years, coming through wills and bequests and so forth. The conference board of trustees was in charge of this property: farms, mortgages, loans and things like that; and that business had to be taken care of. We had a farm manager, of course, who looked after the farms, the renting and so forth, but then it all had to come to a head. There were nine members of the conference board of trustees: half laymen and half preachers; that is, four and five. One of the very interesting things of my experience as president of the conference board of trustees was that the two trusts that were given to the conference while I was president of the board of trustees are the trusts, the two trusts, that are bringing the most money into the conference at the present time. We asked for retirement in the year 1957 because I had passed my 65th birthday and we were permitted to retire after 65. I had sort of made up my mind when I started preaching that if I got to preach until I was 65, I would make room for the younger preachers. But there was a shortage of preachers and I served as associate pastor at First Methodist Church in Lincoln for three years; had charge of the Havelock Methodist Church in Lincoln for six months while the one preacher went away and until they got another preacher; and then had charge, complete charge, of the two churches, Greenwood and Prairie Home, outside of Lincoln 15 miles, for two years. That was the years 1966 to ’68. Of course, in the interim I did a lot of filling in. When the preacher would go on vacation, I suppose I’ve preached then 100 different churches in and around Lincoln here.Recently I performed the wedding of my grandson [Charles Lee Klutts], performed on the 20th of April, 1977, right here in our home. We were delighted to think that our grandson and his bride would want to get married in grandpa’s house and have grandpa perform the ceremony. There were 14 of us here at the wedding and we had a beautiful wedding. Yeah, I always like to make young people happy, and when they want to get married, I hope that they’re getting ready to have a long, happy life. Yes, I have advice to David. Always try to do the thing that is right. Try to do the thing that is good. Try to follow and serve Jesus, and think of God as your loving Heavenly Father. Charlie: David, what do you think of that advice? David: Well, I think it’s OK! Enter your email address to subscribe to the LAFFhouse and receive notifications of new posts by email. Copyright © 2019 LAFFhouse All Rights Reserved.